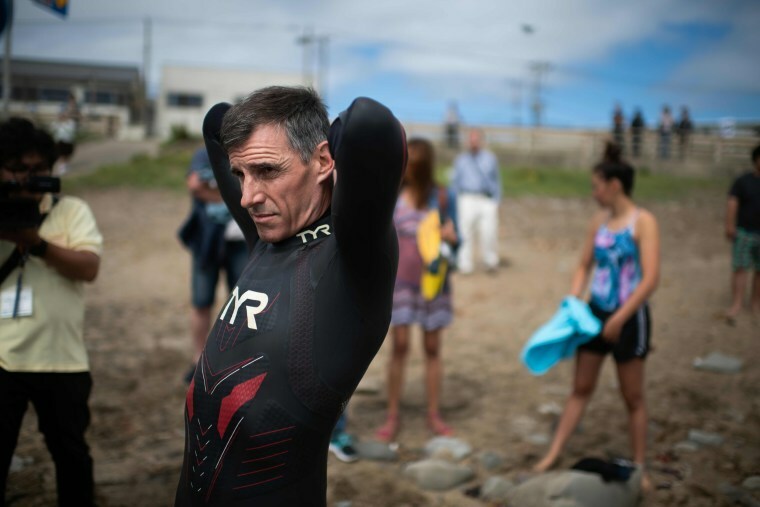 A 51-year-old French-born adventurer began an attempt to swim across the Pacific Ocean on Tuesday, saying his endurance odyssey is also intended to focus world attention on environmental challenges, like the plastics that are contaminating the world's oceans. Benôit "Ben" Lecomte entered the water in Choshi, Japan, aiming to reach San Francisco about six months from now, after a swim estimated at 5,500 miles. Lecomte said he is undertaking the expedition as a kind of existential challenge and to help publicize threats like the Great Pacific Garbage Patch — the vast expanse of man-made pollution that fouls that ocean. A website for the journey called the Longest Swim promises groundbreaking studies into the health of phytoplankton, the impact of radioactive fallout from the Fukushima nuclear accident, and the results of sea life making a home on plastic debris. Lecomte plans to swim eight hours a day and to rest on his support craft, the 67-foot sailing yacht Discoverer. He is wearing a wetsuit, snorkel, fins and a shark-repelling bracelet. His support crew will be monitoring his physical and psychological well-being, another part of the expedition’s research. Lecomte would be the first to complete the Pacific crossing, though it is not his first transoceanic endurance test. In 1998, he claimed to be the first person to cross the Atlantic Ocean, swimming from Massachusetts to Brittany in France. A Rocky Mountain News article later doubted whether the endurance athlete could have covered the 3,716 miles in 73 days, but the feat has been accepted by others. Lecomte, a sustainability director for a consulting firm, has lived more than half of his life in Texas. After initially saying he doubted that he would try another ocean ordeal, he became intrigued with the idea of crossing the Pacific. He began planning the second ocean crossing more than six years ago and persuaded a dozen research organizations to support and monitor his voyage. Among the scientific backers is the Woods Hole Oceanographic Institution. A group of scientists trained at Woods Hole in Massachusetts plan to draw on ocean samples taken every day or two from the Discoverer. They will be looking for how sea organisms interact with plastic contamination, in what they call the “plastisphere” — the zone where organic and man-made material come together. The samples and DNA from organisms that attach to plastic will be preserved, according to an online description of the research. The scientists hope to answer a number of questions, including: What organisms are living on this new man-made substrate out in the ocean? How are the microbes and animals that colonize the plastic affecting it? Are they breaking it down? Are they making it sink? By collecting samples for the entire breadth of the Pacific, the researchers may be creating a unique data set, wrote the microbial ecologist Erik Zettler, who is part of the research team. “So that’s very important,” Zettler wrote. Being an expedition for the digital age, the Longest Swim has a Twitter handle (@thelongestswim), a small raft of YouTube videos, a Facebook page about the beginning of the swim and a documentary film crew, from Nomadica Films, in tow. His location and the local weather conditions will be available on a live tracker. But an extensive description on the Longest Swim website suggests other dimensions to the quest.